Seton Spine & Scoliosis Center, main office located in Austin, is a regional center specializing in back and neck problems. Seton Spine is the only spine specialized neurosurgery, orthopedic surgery, and non-surgical rehabilitation group in the central Texas area. It currently receives some of the most complex cases of back and neck pain from across the state. Seton Spine & Scoliosis Center is able to care for any type of back or neck problem, from the simple back or neck strain all the way to the most complex spine surgery. 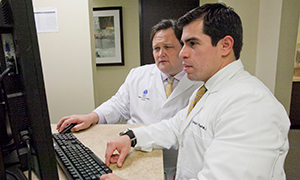 What makes this Austin spine center unique is its emphasis on a nonsurgical approach to back and neck problems. 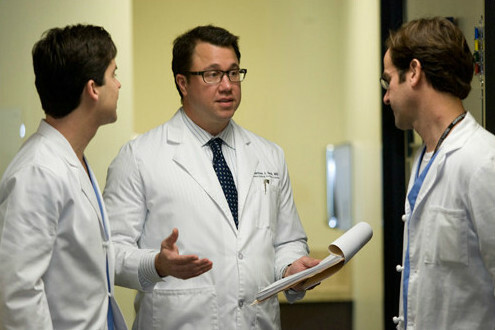 Most spine treatment centers are directed by surgeons who favor the use of spine surgery. At Seton Spine & Scoliosis Center, however, our multifaceted team of physical medicine, orthopedic surgery and neurosurgery specialists, takes all factors into consideration before mapping out a treatment plan. These physicians, E. Kano Mayer, MD, Lee E. Moroz, MD, Enrique B. Pena, MD, Matthew J. Geck, MD, John K. Stokes, MD and Eeric Truumees, MD have advanced training in the treatment of back and neck pain and are successful in helping people return to activity – without surgery. 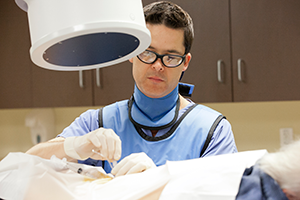 Seton Spine & Scoliosis Center takes a multidisciplinary, team approach to spine care, involving both surgical and nonsurgical spine physicians. This team of professionals pools together its expertise to develop the best treatment for each patient. We provide all the necessary diagnostic testing and treatment in one place, eliminating the need for multiple referrals, delayed care and overall confusion. Sometimes surgery is the best treatment option, especially for those suffering from herniated discs, spinal fractures, spinal deformities, spinal tumors and scoliosis. However, it is estimated that over half of back surgeries performed are unnecessary, and in some cases, even counterproductive. At Seton Spine & Scoliosis Center in Austin, surgery is used as a treatment option only after nonsurgical treatments have been tried. 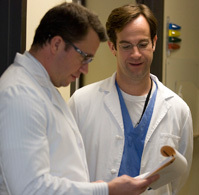 When surgery is the answer, the two fellowship-trained surgeons at Seton Spine & Scoliosis Center, Dr. Geck (orthopedic surgeon) and Dr. Stokes (neurosurgeon), are highly trained and proficient in the latest minimally invasive techniques for spine surgery. Unlike many other spine care providers, the spine patients who undergo minimally invasive surgery at Seton Spine & Scoliosis Center can often have their surgery on an outpatient basis and be home later the same day. The spine surgeons, Dr. Stoke and Dr. Geck, at Seton Spine & Scoliosis Center, located in Austin, partner with Ascension Seton Hospitals to perform minimally invasive spine surgery, enabling many patients located in the greater Austin & central Texas area to go home the same day. Recovery in one’s own home can be more comfortable than staying in a hospital bed. Our team strongly believes in educating patients to make informed decisions about their medical care. As a free community service, Seton Spine & Scoliosis Center in Austin has a full-time RN who provides medical advice and general information on back and neck pain. We also send out our home remedy book for free. We have learned from experience that the best way to treat back pain is before it happens, by educating people on ways to lower the risk of a future back pain attack. This educational Web site demonstrates our commitment to this goal. We hope you find it helpful and informative.